1. Marble Salt & Pepper Bowls with Spoons - There are endless uses for marble bowls, and they last forever. | 2. I like the unisex look of this Luigi Bormioli Decanter. Most decanters are either entirely masculine or feminine, but this one finds a good balance. | 3. Brooklyn Thread's Agate Stone Coasters (available in more colors). I discovered Brooklyn Thread at a West Elm "Meet the Makers Event," wrote about it here and have loved them ever since. These coasters are the perfect pop of color for your coffee table. | 4. Gold Alan Side Table - Small tables like these do wonders for making a room look complete. | 5. These silver plated giraffe and zebra shakers do double duty as a practical item and decor - so modern and fun. | 6. 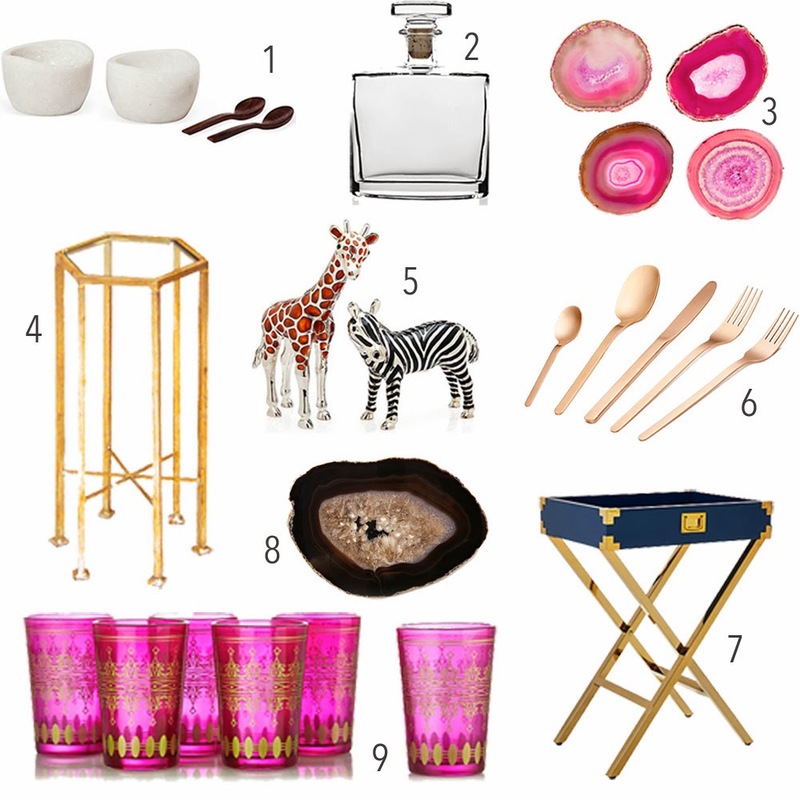 5 Piece Domino Place Setting in Rose Gold - Gold flatware is hugely popular right now. If you don't want to invest in a complete set, why not buy just a few place settings for a small, special meal? | 7. Hayward Tray Table in Navy - One of my all-time favorite color combinations. Plus how gorgeous would this table be used as a bar cart?! Tray tables are such versatile pieces. | 8. Brooklyn Thread's Stone Trivet (available in more colors). Trivets are usually dull, so these are very refreshing. 9. This Set of 6 Moroccan Tea Glasses would be a cheerful addition to a glassware collection. | PS: If you're not a member of One Kings Lane yet, sign up!